In 2012, following Middlebury’s most recent reaccreditation, we decided to act on two recommendations made by the accreditors. The first was that we revisit our board governance structure. We did this, and a new board structure went into effect last July. The second was that we clarify the relationship among all of Middlebury’s schools and programs. This leads us to the announcement today—January 7, 2015—that we are introducing a new Middlebury identity system. What you will see and learn about on this site is the result of a process that has taken more than a year and has benefited from the input of students, alumni, faculty, and staff. We hope you will take a few minutes to see how it all came together. The Middlebury shield brings together images familiar to generations of Middlebury alumni while also giving newcomers a sense of our history and pride. In the upper right quadrant is an open book, referencing the academic project at the institution’s heart and also the image in the college seal. The upper left quadrant features a globe, which refers to Middlebury’s global perspective. The shield’s center features Old Chapel, the iconic building on Middlebury’s campus. The background displays a silhouette of the Green Mountains near Bread Loaf, which are visible from campus and home to two of Middlebury’s signature programs. The bottom shows the college’s founding year. This identity system visually aligns all of Middlebury’s schools and programs. Each program’s accomplishments will reflect on Middlebury, and the accomplishments of the whole will enhance the individual programs. 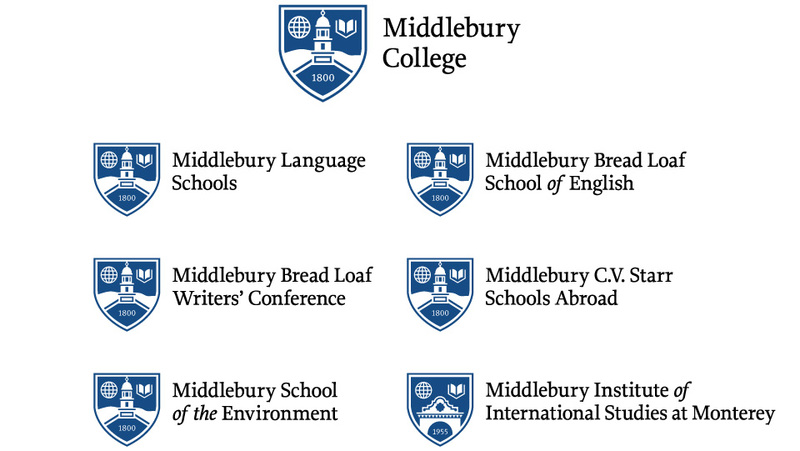 Two features of the new identity system accomplish this: First, we’ve standardized the names of the schools and programs so that they all start with “Middlebury.” Second, we’ve unified the logos of the seven schools and programs around shared typography, color, and—in six cases out of seven—the new Middlebury shield. In the seventh case—that of the Middlebury Institute of International Studies at Monterey—we created a modified design that replaces the mountains of Vermont and Old Chapel with the historic Segal Building from the Monterey campus and the year of the Institute’s founding. Why did Middlebury decide to undertake this project now? To a certain extent, it was good housekeeping. As our various programs were devising new ways to promote themselves, we kept running into questions about whether particular approaches were in keeping with the broader institutional image. Rather than answer these questions piecemeal, we decided to look systematically at the proper relationships between the college, schools, and programs. This process led to the system of names and visual touch points that you see here. Why create a new shield? Couldn’t the college seal have sufficed? We did consider using the college seal for this system, but as we looked at it in the context of contemporary design requirements, we realized it wouldn’t work for the range of applications required, nor necessarily send the message we wished to send about the future of our institution as a whole. Rather than alter the seal, which we didn’t want to do, we decided to produce a new mark. Does the shield replace the college seal? Absolutely not. The college seal is still the official mark of the institution, used in ceremonial contexts such as diplomas and commencement celebrations. It hasn’t been altered or replaced. Why did you create a different shield for Monterey? As we were developing this system, we engaged in many productive conversations with faculty, staff, and students at Monterey. They understood and, indeed, many applauded the impetus behind our project. But they found the shield’s artwork too distant from the Monterey experience, since it alluded to the mountains and setting of Vermont. As a result of those conversations, we settled jointly on the design of the Monterey shield. We hope it expresses a strong family relationship to the other parts of Middlebury while acknowledging the distinctive path by which Monterey became part of our institution. To learn more about the Monterey project, visit here. 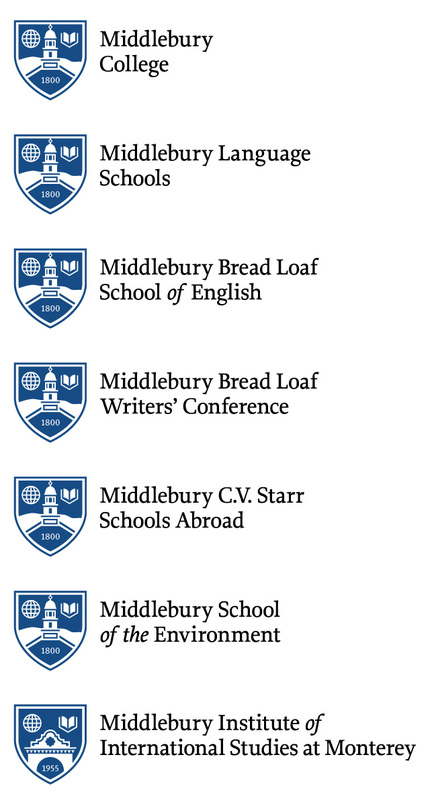 What does this system say about the autonomy of programs—for instance, the Bread Loaf programs—that in the past have operated with some independence from Middlebury College? We appreciate the specific loyalty that many—indeed all—of Middlebury’s programs have engendered over the years. We don’t want to reduce the autonomy or the attachment that students and alumni have to their particular programs. We only want two things. First, we want our own community, as well as the broader one, to understand that Middlebury encompasses more than they might know. And, second, when a program does something wonderful and receives recognition for its accomplishments, we want people to understand that these accomplishments reflect on all of Middlebury. It doesn’t hurt—and, really, can only help—if our students, faculty, staff, and alumni (to say nothing of the public at large) are aware of the institution’s many facets. How can particular offices or departments get hold of the logo for use on business cards and other printed material? Contact the Middlebury Office of Communications and Marketing for guidance on using the new identity system. We’re eager to help you implement the new program. The Middlebury identity project was highly inclusive: we spoke with many faculty, students, and staff in the course of developing the system. We also want to hear from you. If you have comments or questions about the new system, please use this form to forward them to us. © The President and Fellows of Middlebury College, 2015. All rights reserved.